When we adopt a dog, what we expect is for them to be happy. We like to think that they get what’s happening and that it’s all blooming marvellous. We tell ourselves that they know what’s going on and that they’re going to love it. Lady, you are the best person I ever met. I’m going to be such a good boy! We are going to have the most amazing adventures together! I’m just going to lick you and lick you and lick you. Thank you! Thank you so much. See my waggy tail? That’s how happy I am! Who the hell is this woman? She seems very nice. I wish she’d stop looking at me. Please don’t touch me. Don’t touch me… Don’t touch me. I don’t even know you!!! She’s touching me. I don’t like hands. Hands hurt. Why is she touching me? Where are we going? What’s going on? What’s this tiny thing? What’s that noise? What’s she doing? Where does she want me to sit? It sure smells funny in here. What the f@*&’s that noise? Why is the seat moving? OH MY GOD this thing is moving!!!! I want to get out. Can I get out. How do I get out? Where is the door? How can I get out? Stop touching me! Stop looking at me! Not only did I pop him in the car, I took him to a new house. I introduced him to new animals. I set him up to be stressed and without really considering it (he was the fifth dog I’d adopted) I didn’t think about the stress he was feeling. It took five months to wrestle him back to a place of calm. Sorry Meegie. I wish I could start again. Luckily, he forgave me for this and I hope he feels safe now. The modern world is stressful to a dog. They are living in a world that does not always make sense to them. It’s akin to moving to a different country with a different language and very different customs. Notch that discomfort up a little and you get a sense of what it must be like to live in a dog’s world. If your dog has ever barked at anything new, you may have laughed it off, because we simply don’t know what will freak our dogs out. Tilly spent a good five minutes barking at the washing basket in the garden yesterday. I don’t know why. She’s seen it before. It’s been in the garden before. Nothing was different in most ways than every other time the laundry basket has been in the garden. But yesterday it spooked her. Heston once spent a good while barking at a sieve. A stone cross also freaked him out. Amigo doesn’t like to be inside during storms. Molly used to bark at snowmen. It’s common for dogs to bark at hoovers, lawnmowers and other animals. These are fearful responses to things that don’t make sense to dogs. But barking is not the only way that we can see an animal is stressed. Creatures feel fear and have a stress response. This we know. When something makes us feel afraid, our bodies have surprisingly similar responses as a dog’s. Adrenaline is produced. Our heart rate increases. Our brains become less capable of making choices as our fight-or-flight response kicks in. Once the brain says, “hey I don’t like this!” the thalamus gives us a shot of hormones that set us off on a very typical “stress pathway”. Ever tried to reason with someone who’s red in the face? Ever tried to get your dog back under control when they’re barking at a stranger? You’ll know how hard it is to overcome the stress response. 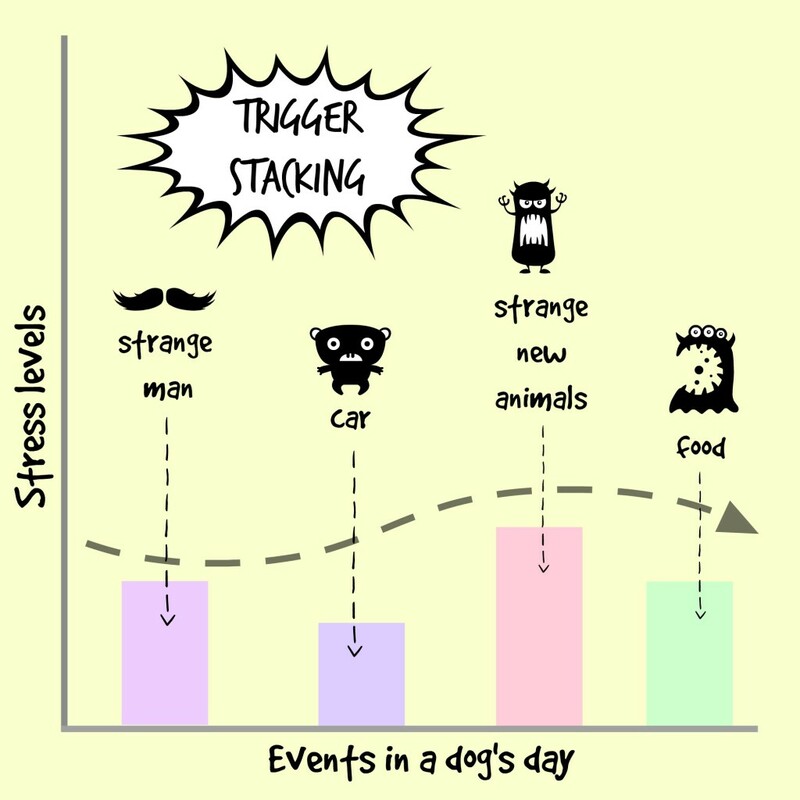 What normally happens in a dog’s day is that they meet a series of stress-inducing triggers. If you’ve socialised them and introduced them to these triggers when they are young, they will most probably learn that these things are nothing to be afraid of. If you don’t, you’ve got an uphill battle to show them that a strange man in a hat is nothing to be afraid of. When we adopt an adult dog, we have no idea what they have been socialised with and what is a trigger. For the most part, our dogs meet an unfamiliar trigger and then they move on. They may growl, show their teeth, snap or bark at it as they attempt to “fight” the trigger, or they may run away to a safe distance and hide if they are in “flight” mode. The other week, someone dropped a sack of fertiliser by the side of the field. Heston did both of these things: he stood, he stared, his hackles went up, he growled. The thing didn’t move. He went a little closer and growled more in case it hadn’t heard him. Then he barked at it. It didn’t care. He went closer, barked and then backed off. He did this progressively, getting gradually closer until he’d decided that it was nothing to be scared of, barking, retreating, barking, retreating. Normally, the trigger goes away and the situation returns to normal. The body stops making stress hormones and within 70-110 minutes, most of those hormones have dissipated. The dog learns to tolerate these small events and episodes. Cats in the garden, postal workers, teams of cyclists going past… they’re strange and unfamiliar events and your dog will have periods between them to recover. But what we do with a shelter dog is take an unfamiliar dog and give it a short, sharp shock of everything we know to be stressful. We take a dog who is already stressed. Even two weeks in the shelter is enough to have long-lasting consequences on the stress hormones and body, especially if they have been kept on their own. Shelters are good at recognising unnatural stress responses for dogs, but there aren’t often solutions to this. Displacement activities may be evident (licking, grooming and eating stuff they shouldn’t) as well as stereotypical responses such as circling, excessive grooming, tail chasing, tail biting, excessive drinking, fence-line running, anorexia or excessive eating (yes, dogs comfort-eat too) and dogs may even hallucinate, chasing imaginary flies or staring into space. But there are many dogs who do not exhibit such behaviours in kennel environments, and we may be unaware that they are very close to the point at which they cannot control their responses or when it all becomes too much for them. We call this point the “threshold” and it’s marked in red on the diagram below. 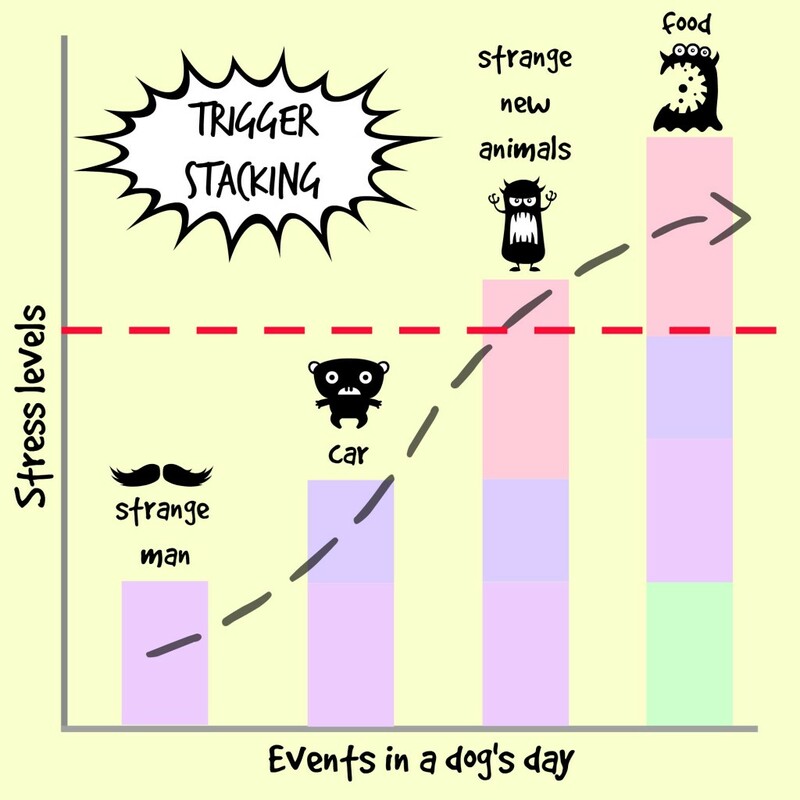 When we take a dog and subject it to a range of new and stressful experiences, we stack those triggers all together, and we are not allowing their bodies to deal with the triggers we are subjecting them to. In one short hour, everything changes. They go from an austere environment where the majority of dogs show some signs of stress, and we think that what we are doing is comforting and reassuring. It isn’t. We introduce them to new people. We may put them in a car, which they may never have experienced except for a brief trip to the pound or their journey to the refuge. We take everything in their world and turn it upside down. And instead of being able to tolerate the stress, we don’t allow sufficient time between all of the changes, and we stack the triggers so that they build up, one on top of another. Once they pass the red line, you are going to see exaggerated stress responses. Stares and teeth displays or pinned ears and avoidance techniques can turn into defensive attacks. This might just be a good old bark or grumble. They may urinate (I showed Tilly a new dog coat once and she did this…. I call her Tilly Piddle for a reason!) They might “give in” completely, overwhelmed by fear. They may try to run away or hide. In French, we say se sauver, which literally means they try to save themselves. There are lots of things you can do to avoid this situation. Visiting the refuge often to meet the dog and spending at least an hour with the dog before you adopt them is one of those things. For dogs showing signs of an unnatural stress response (licking or circling, bark displays) you may want to sit in with them for a couple of hours, doing absolutely nothing until they are ready to approach you for a high-value treat. Giving them a small amount of high-quality treats will show you that their stress levels have gone down enough to think of moving on to the next stage. Heston accepting treats when he met Tobby was my cue that he was sufficiently unstressed to move in a bit. But take your time. Though the adrenaline will have dispersed, the cortisol will not. I was also really glad to see a lady taking the time to introduce her new dog to her car, spending a good few minutes over a few days getting him used to being in it, then turning the engine on, and so on. Not all dogs will need this if they have been used to getting in cars as a puppy. I’m pretty sure Heston would hop in anybody’s car given the chance. Cars mean adventures to my dogs because what happens after being the car is 99% good (except those vet trips!) But for a fearful or anxious dog, the guidance she’d received will certainly help the dog feel more comfortable. If you have other dogs, be careful how you introduce them and take your time. When Tilly and Saffy arrived here after their car journey, I just randomly let them meet Molly, the new house, a whole load of strange men… no wonder Tilly quickly turned to submissive urination and excessive drinking. I’d say it took a good four or five months for her behaviour to return back to “normal”. You know my story of Amigo already. That ended with five months of serious retraining. Ralf… I got smart. Tobby… even smarter. And guess what? Those dogs weren’t stressed out. I doubt whether Ralf ever got stressed, since he was a big, chilled-out mattress-back. Tobby certainly has stress responses: he is happy to run away and he has the potential to bite. But I like to think that I did everything I could to avoid walloping those triggers one on top of each other that first day home. Avoid stacking those triggers and you’ll avoid pushing your dog to the limits of its tolerance. Time and calm is your best friend. Although everyone will want to come round and say hi to your new dog, what is best is a recovery period. Although you may want to give your new dog toys, treats and love, what they need is calm. Perhaps the very best thing you can do is sit very quietly for a couple of hours and read a book whilst they make some sense of their new environment. It’s not exactly what you envisaged, I’m sure, but it’ll help break up those triggers into manageable blocks. 10 tips to dog-proof your home. The first few days that your new dog is at home with you are the ones that set the tone for your whole relationship. Although you may want to grant your dog the freedom of the house following their time in a shelter, it’s definitely not the way forward. A dog won’t understand why first night cuddles on the sofa aren’t a permanent thing if you would prefer him to stay in his bed, and they certainly won’t understand why, when they cry the first night and you let them on your bed, that this isn’t the way it will be for the rest of their life with you. If you are looking for advice on house-training or on fearful dogs, you will find further information on the site. Please bear in mind that many dogs, even dogs who have lived in a home all their life and spent less than an hour at the refuge, can have a bit of an issue with house-training and knowing where to go. Some dogs may have one or two accidents and others may be stubborn, especially if you have other dogs. Even if you are sure you are getting a dog who has been house-trained, a change of circumstance can mean a change of bladder habits and it is well worth a read as a dog’s cleanliness depends on you even before you come in through the door. Even if you do not think you are getting a fearful dog, a change in circumstances can be very disorientating. Slipped collars and dogs who dash out of cars can cause owners no end of worry and there are many dogs who are never found again. Reading the article about fearful dogs can be a lifesaver, literally. A sliplead, harness and supervision at all times in the garden for the first few days can make all the difference. Many dogs are subjected to new experiences and you may find that they have new fears. Being indoors. Many dogs in France live outside all year around. A house can represent a small, enclosed, unfamiliar space and although you think that your new dog will love being cosied up with you, a house can be terrifying if you have never been in one, or, indeed, if you have spent your life being kicked out of one. If you have other animals inside, this fear can be very intense indeed. The dark. Many refuge dogs are left alone when the dark comes, and they may come to associate it with abandonment or loneliness. Do not be surprised if your new dog shows no desire whatsoever to go out at night. This can even lead to puddles, so make sure it’s not a fear of the dark rather than stubborn resistance to house-training. Windows and patios. Houses in France may have French windows, but most rural houses do not. Seeing their reflection for the first time can be disorientating, and it can be hard for some dogs who have never had a head-first experience with double glazing. Barking at their own reflection, or even wagging, are very common, as are accidental collisions. Make sure you introduce your dog carefully to low glass and mirrors! Stairs. Many houses in France are single-storey, or owners have never permitted dogs upstairs. It may take your new dog a while to get used to going up and down stairs. Something to bear in mind is that going up is one thing, but coming down is another altogether and if you get your 50kg dog up the stairs, you may be faced with the task of carrying him down. Fireworks and thunder. These are standard fears for many dogs but seem to be worse for ex-shelter dogs. Don’t leave your dog out in storms or you may find that they’ve done a runner. If you can see from the weather that storms are predicted, try to make sure you are home with your pet and that you can gauge their reactions before you leave them home alone. Being on their own. Unless you have adopted a breed that is valued for its independence, you may find that your new rescue pet is terrified of being alone. This may be because they were abandoned before, or because they are left at the refuge, but it can also be because many French dogs are bred for sociability and being able to be part of a pack. Being isolated from the pack can be an overwhelming experience. Fear of the vet. Some dogs arrive in terrible conditions and are quickly seen by the vet for the first time in their life. Others meet the vet for the first time when they have an injection. Needless to say, the first vet experience for many refuge dogs is a painful one, even if the vet is very experienced and gentle. Most arrive and are in a high state of anxiety and fear. Seeing the vet can be the first real interaction they’ve had and it is not always pleasant. Please make sure you are aware of your dog’s behaviour round vets and don’t be afraid to take a muzzle and a friend if necessary. This isn’t a shelter-dog special phobia: many dogs have a fear of the vet. If it takes four of you to hold a muzzled dog down to clip its nails, don’t be too alarmed. Better to have too many hands than too few when your first vet visit is due. You can also ask the shelter staff who will have certainly accompanied your dog on their vet trips. Fear of men. Many people assume that because a dog is afraid of men that they have been beaten by a man. This is not strictly true. Dogs rely on seeing our faces and the taller you are, the harder it is to see what you’re feeling. They just might never have had much experience of tall people and so it causes them alarm. My own dogs don’t meet many men and they are much more shouty about men than they are about women. A gentle woman of my height can be an absolute stranger and yet she will be greeted much more gently than a man who is much taller. My dog Heston barks at tall men. He has never been abused by a tall man, or even had a mildly negative experience: it’s just lack of socialisation with them. Fear of children. Again, this is less than they have been abused by children and more that they have never met children. Children are freaky, unpredictable things to some dogs. They have moving parts that do different things than adults do – all those swinging limbs and uncoordinated feet! There are hands that pull, or pet weirdly, faces right at their level… it can be a dog’s worst nightmare. Fear of weird objects. Brooms, hoovers and washing machines are usual culprits: moving, noisy things that don’t make sense to dogs. This isn’t always the case and you may find your dog barking at a sieve, a snowman or a stone cross. Heston has barked at all of these things. He spent five minutes having an argument with a fertiliser sack once. Gentle desensitisation is usually the key to overcoming most of these fears, but you will not be chastised for avoiding them completely if needs be. Sometimes, if it’s not necessary that your dog get used to stairs or snowmen, why bother? On the other hand, men and children are probably going to be things your dog comes into contact with and it will be worthwhile desensitising them to these things. At the pound and the refuge, the staff are experts in introductions. We make up between seven and forty new pairs of dogs a week and there are several things we do that can help you as well. The choices we make are based very much on choices you can make before adopting. There are decisions we make without knowing the history or personality of the dog. These decisions are based on gender, breed and size. Female-female introductions can be the hardest ones and can cause the worst fights. Male-male introductions can also be very difficult, especially if neither dog is castrated. The easiest introductions are between sterilised females and castrated males. There are no hormones and no agendas. Size is also a factor. Similar-sized dogs are generally less aggressive as they feel less afraid of their new partner. Small dogs can feel intimidated by bigger dogs. Bigger dogs can be very afraid of smaller dogs, believe it or not. Breed is a final factor. If a dog’s breed is one for independence, you may find you are working against hundreds of generations of careful selective breeding to end up with a dog who is independent, territorial and protective. For this reason, shepherds and rottweilers can be very hard to pair with others if they have not been socialised at an early age. Likewise, hounds who have been bred to work as a pack and live with other dogs may find it very distressing to be on their own. Recent studies have shown up to 70% of dogs feel anxious when left alone, and that is reduced to 35% when they have a friend. That’s a lot of dogs who need company and who need the presence of a canine companion. These factors do not mean it’s impossible to integrate two dogs. I have two entire males who get on fine. 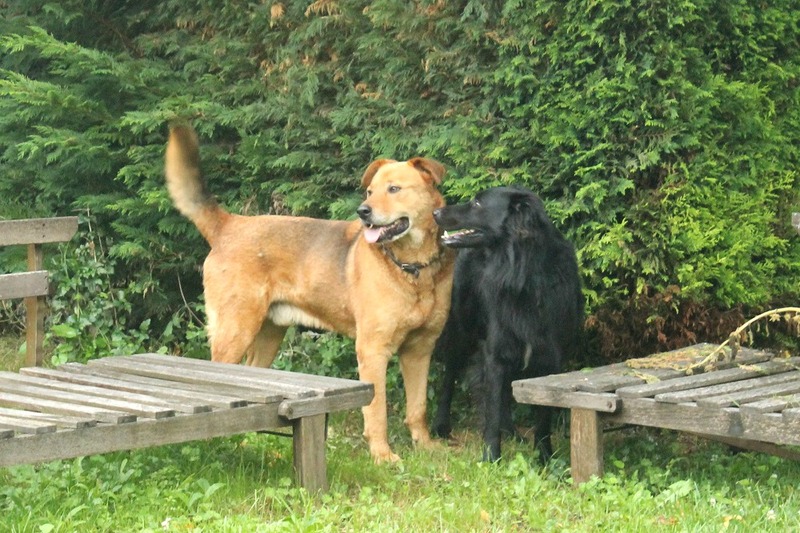 One is a Malinois shepherd and the other is a collie x flat-coated retriever. It works because there are other factors to consider: personality and history. Personality very much depends on what you know about your dog. How are they around others? You know better than any other about how your dog gets on with others. Have you socialised your dog? Are they used to meeting others and even living with others? Have you had other dogs in your home? If the answer is no to any of these questions, you may have a bit of work to do before taking on another dog. Please don’t assume that a puppy is the solution if you are looking to adopt a dog. If your dog is poorly-socialised, doesn’t meet other dogs regularly (at least once a day) and has never lived with another dog for more than 24 hours, you may want to ask yourself why you want to change the dynamic of your home. A puppy is as big a threat as a full-grown dog to some. When you know your dogs, you know how they are around others. My American Cocker Tilly is fairly well-socialised but she yaps like a fiend at other dogs for about two minutes. If they do nothing, once she’s said her bit, she is happy to get on with her daily business. She needs to be the boss and she will happily tell another dog off if she feels threatened or if she feels it is getting in her space. She doesn’t like dogs who invade her space but she is fine if they have good manners and leave her alone. For a long time, I thought Heston was not okay with other males. This is not true. He is very good with older dogs and very respectful of their space. He is also fabulous with puppies and bigger dogs. He hates other dogs to sniff him over much, but he loves to sniff them – kind of ironic. He is actually okay with males if I am in control of how they meet and if they do not bark at him. Once the two minute tension of a first meeting is over, he is fine. I trust him completely with little dogs as well. The older he gets, the wider his repertoire of dogs is. Amigo would prefer to be an only dog. He is not a fan of other dogs. He never wants to smell them. When I got him, I thought he was fine with other dogs. I had no idea of his history and had never seen him react to other dogs. Now I know him, I know he is fine with other dogs who are under control. Off-lead, in-your-face dogs with no manners are his worst nightmare. Ralf was fine with all other dogs. All. He was never aggressive or grumbly, although he was a bit of a humper. Tobby is great with other dogs, but he doesn’t have good boundaries. He likes to say hello and if they don’t say hello back, he gets a bit obsessive. If they say hello back, he’s fine and he’s moved on. He is not a fan of puppies or small dogs who run in between his legs. He is scared of terriers. I know this stuff now. These are the kind of things you need to know about your own dogs before you adopt another. Once you know your own dogs, you can make sensible decisions about what would be a good match for your dogs. And despite what your own heart wants, your dogs might disagree. It’s them you have to listen to. So how do we make greetings go smoothly? At the refuge, we take them into neutral territory. This is the alley behind the refuge. It’s “owned” by two hundred dogs, so it’s not got any emotional stakes. We walk in the same direction, about 100 metres apart, and we gradually close the gap. You can make a choice if you have reactive dogs about who goes at the front. Sometimes it’s better to have the reactive dog at the back so that they can see the dog as they move towards them. How long you take depends on the dog. There’s no rush. It can take minutes, hours or even days. That’s all fine. Wait until you can get the dog’s attention on you and do not approach the other dog until you can. Take your time moving in closely and keep moving in the same direction as the other dog, making the distance smaller and smaller. Maintain a positive mood with the other handler and chat to them as you get closer. Ignore the dogs as much as you can. When you are happy that the initial fear, curiosity and aggression has disappeared and the dogs are more under your control (or back to their normal energy levels!) you can walk alongside the other person. Keep the dogs at a safe distance so that they cannot lunge to attack the other dog. Do not force your dogs to sniff each other or get in each other’s faces. Dogs take time to suss out the other one and you’ll see them looking at each other as they size each other up and begin to relax. Walk alongside each other and gradually relax the leads so that they can approach each other. Be prepared to separate them and never, ever get in between two dogs who decide to turn on each other. If this happens, pull them away and quickly walk off, getting as much space as you can between the dogs. Watch for signs of playfulness between the dogs, but don’t force it or expect it. Some dogs take seconds to decide to play; others may never, ever engage in playful behaviour. Both are fine. Watch the dogs’ body language as well. A wagging tail is not a sign of playfulness or friendliness in all circumstances. This blog post from Tails from the Lab is great for explaining doggie body language in more detail. You can see posture asserting going on here between Ralf and Heston, tails raised high, Ralf deliberately avoiding Heston’s gaze. They’re both panting a bit because it’s stressful. Heston’s eyes look worried and they really are sizing each other up. Heston’s tail is down and he’s loose, but Ralf’s hackles are up a little and his tail is raised high. He’s making himself all big. He lookes Heston in the eye and Heston looks away. Ralf’s wagging tail is big and high. This is not friendly wagging. It’s posture wagging. I’m not worried though. It took them three or four minutes for them to set their own boundaries. I’ve heard people before say “you’ve got to let the dogs sort it out”, but I don’t agree. Many dogs are very excited on greeting. I’ve no doubt Heston would have attacked Tobby had I let him. Ten minutes later and we’re feeding them side by side on the lead. Heston has bad doggie manners and if I’d not have managed that situation, it would have ended badly. There was no need for a fight, no need for posturing. That initial greeting went well and where I’d been prepared for an afternoon, it took less than an hour. Once you know your own dog’s likes and dislikes, it makes it a lot easier. You should also ask the refuge for dogs that are generally good with the type of dogs you have. Even if the dog has not been at the refuge a very long time, it is likely that they will know whether dogs are generally good with others or not. If you have a pack of dogs, introduce the new dog to the most troublesome first, and take as long as it needs. Get that dynamic out of the way. Then bring in the least troublesome ones. Within half an hour, the dogs will be more familiar with each other and more familiar with their boundaries. Make sure your dogs are well-exercised before you meet. On the day that I brought Tobby home, Heston had a 16-km walk in the morning and then an hour of fetch. I also have a massive bag of treats for each dog and reward them for all positive behaviours. You can also watch this great video from Zak George who introduces two dogs. It’s very useful. The more you are prepared, the better. When you make small, gentle steps and take a bit of time to ensure that the dogs have time to check each other out, you have a much better chance of success. You will see in the video the ‘head over back’ kind of move that Sadie makes over Deuce – that’s one thing I try to watch out for – having seen lots of dogs pairing up, it’s not good doggie manners and it often ends badly. What he says about picking up toys and treats is vital as well. It may be many months before your dogs feel happy to share toys or beds, and these can be real flashpoints. I’d also advise getting a new dog bed and introducing your new dog to their safe space. They should have something that is theirs alone. Separate feeding spaces (different rooms) is also a good idea so that you can build up to eating in the same space. I always give my new dogs their bowl first and make sure they have plenty in it, because I trust my own dogs to be patient where I don’t trust the new dog. Quite honestly, someone sniffing around my plate would make me feel a bit snarly too. There are many reasons to adopt a dog rather than buying one from a breeder. There are no reasons at all for buying a puppy from a puppy farm. For further information on selecting a good breeder, this pdf from the Humane Society will help you make the right decision. You should also read this article by Zazie Todd on Companion Animal Psychology which will help you make your choice if you are looking for a puppy. Rescuing a dog rather than buying one from a breeder does not mean you have to sacrifice your love for particular breeds. 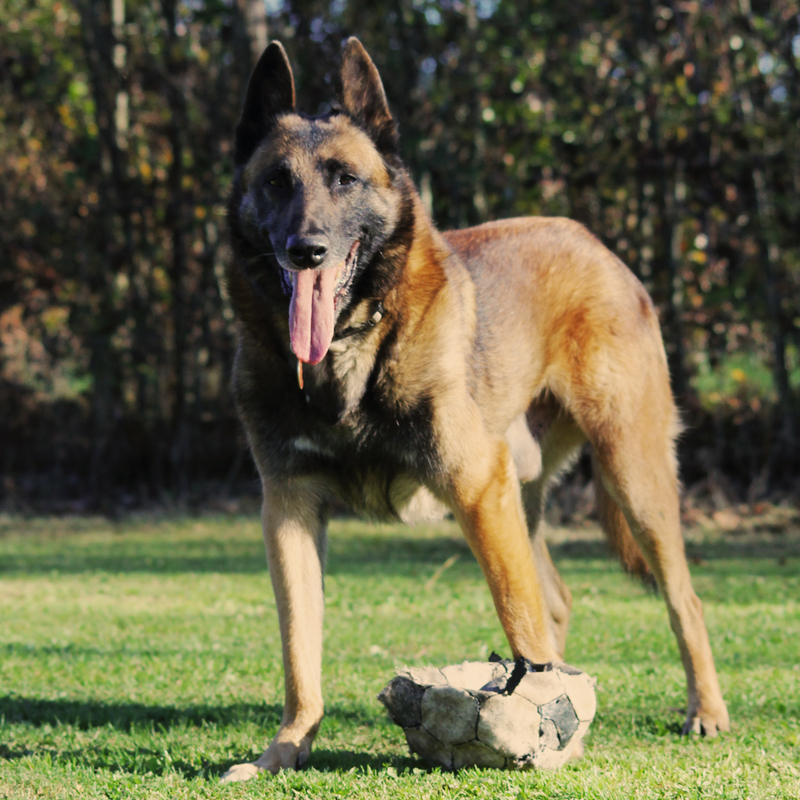 At any one time, about thirty percent of the dogs at the Refuge de l’Angoumois conform to a breed standard, if they do not come with pedigree papers (called LOF papers in France). If you have a love for a particular breed, please feel free to contact us and ask. Whether you have a love of Yorkies, German Shepherds or Newfoundlands, we may have a dog at the refuge that is perfect for you. Please bear in mind that pure-breed dogs move more quickly in some circumstances than mixed-breed dogs and that you may have to wait. You may also want to check out Seconde Chance, a website that allows you to search for dogs by breed and links to all refuges and associations across France. Another way to find an association that specialises in the kind of dog you love is to type in the name of the dog breed, plus ‘association sauvetage France’ into Google which may help you locate your favourite woofers, especially if they are more rare and less likely to find themselves in a refuge. You may have to wait a while, but you get the added bonus of getting the kind of dog you know well or love dearly, as well as the benefit of rescuing. If you are looking for a labrador, a beagle or a scruffy griffon, look no further! We’re certain to have something that you’d like. For those of you who are less particular or who have their hearts open to whichever dog they might fall for, these simple questions may help you define the dog you want. These are questions we often ask at the refuge to help narrow down which dogs will suit your lifestyle. Sadly, taking on ‘any old dog’ if you are not equipped for this may lead to a swift return for the dog and will leave you wary of future adoptions. What level of exercise will you be able to provide for the dog over the next fifteen years? 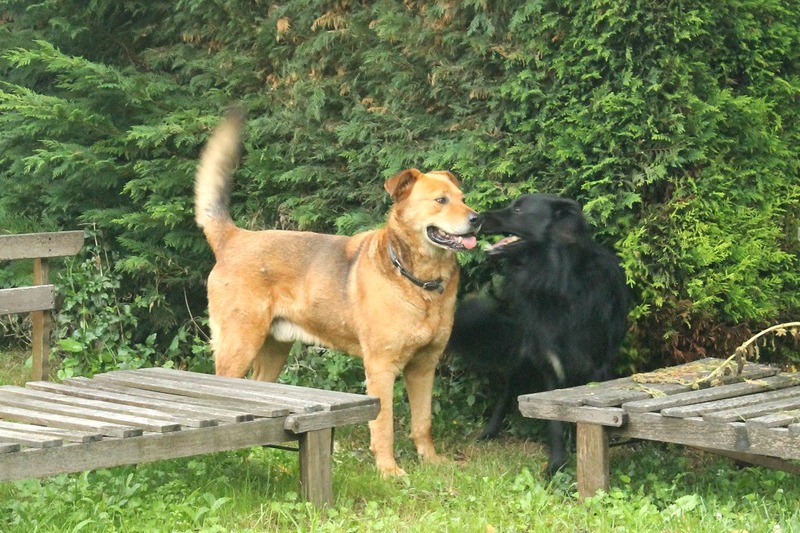 There are always dog boarding kennels, where you dog can run around free and have fun. It’s an ideal holiday destination for your pet! If you are ‘of an age’ (excuse my diplomacy) will you be wanting to walk a hound who is still in the prime of his life when you are eighty or eighty-five? If you are uncertain about your job, will you be able to guarantee that the two hours’ walk a day that you can offer now will be available to the dog in two years’ time? If you have a family, though you might think your children will be happy to play with the dog for hours at a time, will they still feel the same as grumpy teenagers? Choose a rescue dog that not only suits your needs now, but your needs in the future, and think carefully about what you can offer a dog. A big garden is not exercise. It is just another room to a dog. Many dogs will see the garden the same way as they view your dining room: just another space that they won’t use unless you’re in it with them. Getting an energetic dog because you have a big garden is often a recipe for disaster. Energetic dogs need you to exercise them, not to leave them unsupervised in the garden, hoping they will tire themselves out. Make sure you ask about the dog’s energy levels and explain what kind of a life you can offer to your future pet. Are you able to groom high-maintenance dogs, like Newfoundlands, or do you want a dog like a collie that just needs a brush every now and again? Are you prepared for shedding? Will you be prepared to take the dog to a groomer if you cannot clip it yourself? If a dog doesn’t shed, it may need clipping or stripping so bear in mind how much time a week you want to spend grooming your pet. Don’t be afraid to rule out particular breeds and cross-breeds, or to prioritise them. How much space to you have to offer a dog? Do you have a small apartment and would prefer a small dog, or do you have the space for a larger dog? Many large dogs have lower energy levels and are happy to live in smaller houses, but you might not be so happy to have them constantly under your feet. Think about how secure your garden is and whether or not a dog would find it easy to escape from. You can specify what kind of life you can offer and ask for a dog to suit your home needs. How many dogs do you encounter on a daily basis? Do you need your dog to be well-socialised so that you can leave him in doggie day care, or are you going to check out some ready made dog kennels kennels whilst you are on holiday? Do you live in an urban area where many people walk their dogs? Do you live in a space where you can walk your dogs frequently without encountering other dogs? You can ask to see dogs that are well-socialised if you need a dog that will not be reactive on the lead when you pass others, or a dog that enjoys the company of other dogs. What are your family’s doggie needs? Do you have young children that need a dog that has good bite inhibition and is restrained and confident around children? Do you have older children who are looking for a dog they can interact with? Do you have visitors who are afraid of dogs? Make sure you are clear about your family situation and make sure you explain this clearly. Taking the whole family with you when you go to meet your future pet may seem like a bit of a chore, but it will ensure that everyone feels happy around the dog. Do you have other animals who have particular preferences? If you have cats, make sure you ask for a dog that has been tested with cats, and make sure you have explored ways to introduce new animals to each other. A dog that has previously shown no signs of interest in a cat may give chase if the cat runs off. A cat that has previously been fine around dogs may feel threatened if the dog sniffs too vigorously. If you have other dogs, make sure you take them to meet your new pet and follow guidance on integrating new animals. Have you researched dog breeds carefully, once you have narrowed down the kind of dog that you are interested in? Although breed characteristics are no determiner of personality, they can help you understand your dog and its behaviours. Whilst you should never make judgements about behaviour based on stereotypes, it is worth considering these when you have fallen in love with a particular dog. What are the likely behaviours, both positive and negative, of this breed? With these seven questions in mind, you are more likely to be able to pick out a dog that will be your perfect family pet. A little consideration at the adoption stage makes all the difference.